The premise is simple. 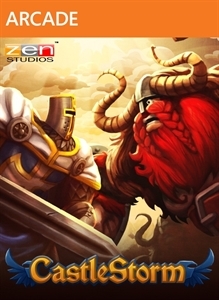 You must defend your castle from a Viking attack, whilst simultaneously launching a counter-attack in order to either destroy your opponents castle, or break through their gate and take their flag. At your disposal, you have ground troops, spells, and most importantly your ballista. As time goes on, you have a food count which constantly increases, and with which you pay for ground troops, with more powerful troops requiring more food. They range from simple footsoldiers and archers, to horseback knights and eventually a griffin or dragon, depending on the faction you're playing as. It's a lot of fun, and deciding which troops to send and which to save up for requires a good strategy. The spells don't cost anything, but take time to recharge. There are nine spells for each faction, from offensive lightning bolts and magic swords, to defensive projectile shields and the ability to turn a troop invincible for a short period. The best spell however, is the Hero. You can summon Sir Gareth and have direct control of him on the battlefield for a limited time. You can use your sword for two melee attacks, and a bow and arrow for ranged enemies. Using the Hero is a great way to clear out a big group of enemies, as their attacks are extremely powerful. Finally, you have the ballista. Most people will be familiar with the mechanics of the ballista, as it plays very much like Angry Birds, or the aforementioned Crush the Castle. Your ballista will be your main form of attack, on both your opponent's castle and troops, and is capable of launching many different projectiles to deal some major damage to structures and people alike. seems like a lot to think about all at one time, but it's in fact very simple. The A, X and Y buttons are used for switching between projectiles, troops and spells respectively, and LB and RB flick through the different options for each. It might take some time to get your head around it, but before too long you're seamlessly firing projectiles at the castle, whilst sending out your troops and defending them with spells. All at the same time. It's a very satisfying system once you get accustomed to it. 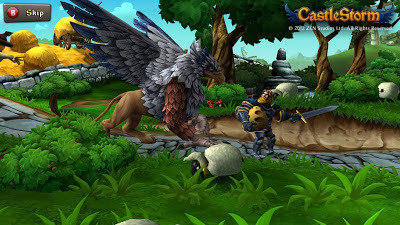 CastleStorm is obviously a castle-heavy game, and you can actually build your own castle using rooms and pieces that you have unlocked by playing through the single player game. You can only use troops in battle if they have a room in your castle. You can also build bonus rooms, which have various effects on the game. For example, one room increases the amount of food you can generate, and one gives you extra gold at the end of the round. Position is key though, because if these rooms get destroyed, you lose access to the troop or bonus associated with the room. Building the castle becomes a strategy game in itself, and can steal a good chunk of your time whilst you construct the perfect castle for your needs. There are three multiplayer modes, including both versus and cooperative play. The versus mode is self-explanatory, and is a lot of fun when playing with a friend. It's easy to play match after match until a few hours has inexplicably passed. Survival mode has you working together, with one player in control of the ballista and the other controlling a Hero, and the goal, like always, is to defend your castle. In Survival, the enemies are more difficult to kill, and their attacks are stronger than they are in single player, so it's a much harder challenge. Hero Survival is similar, but this time both players control a Hero. Again, you'll work together but this time there are no castles, and instead there is one single flag in the centre of the map. Enemies enter the fray from both sides of the screen, so you and your partner will have your hands full. Each mode is completely different to the others, and it really does allow you to play exactly the way you like to. The story to CastleStorm is very basic. It's a simple tale of good vs. evil, but it's told in a wonderful way. It's full of great humour, from references to Skyrim, to toilet humour and a lot of sarcasm. 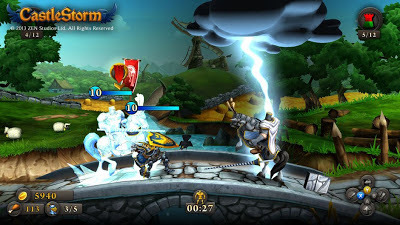 It doesn't take itself very seriously at all and it's just another thing that makes you fall in love with CastleStorm. Things that happen in the story can also affect the gameplay, such as when the soldiers get ill after drinking water from a lake where you just had a battle. Unable to fight, you must defend against the Vikings alone, using only the ballista and spells. It keeps the gameplay so fresh and happens so often that you literally never know what's going to happen next. It's hard to thing of any other game that changes the gameplay so much. Graphically, it's nothing spectacular but it does have a very charming cartoony style. It feels like an old fairy tale, and it completely works with the story and characters. 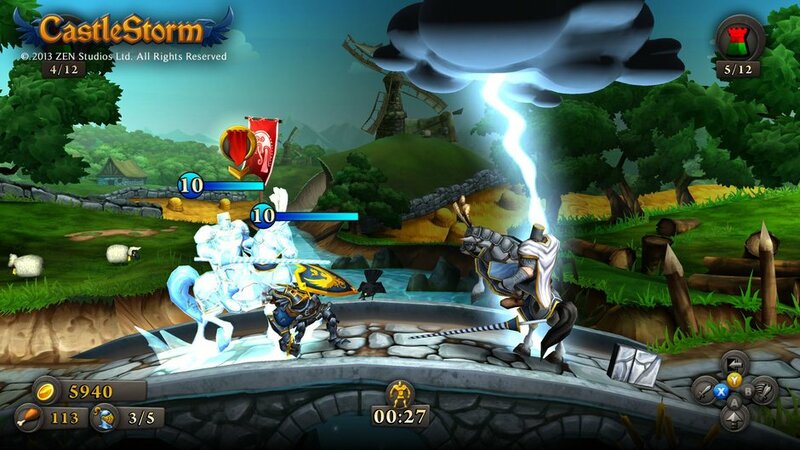 CastleStorm is a surprisingly awesome little game. The gameplay is so much fun, constantly changing and incredibly easy to master, the story is entertaining, the characters are loveable, and the visuals are adorable. I could go on and on. For 800MSP, this is a steal. Certainly one of the best XBLA titles we've been treated to in a while.